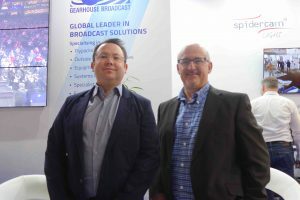 Pride of place on the Gearhouse Broadcast stand at IBC went to SC-Light, the result of its recently-announced joint venture partnership with Spidercam. The suspended camera system is designed to work in smaller venues like TV studios or indoor sports arenas. The reduced size and weight of the main components used makes the system easier to transport and setup, and it’s been built to ensure the safe operation over athletes, audience, or performers within the flying area. It has a larger action radius than other crane or rail systems, and the combination of strong winches and lightweight dolly allow it to get closer to the ceiling. At the show SVG Europe sat down with Gearhouse Broadcast chief revenue officer Eamonn Dowdall and technical director Pete Newton to discuss the Spidercam partnership and the broader picture around the provision and delivery of facilities and crews to major events like the FIFA World Cup, Asian Games, ATP Tour tennis and US Open tennis in what has proved to be a hectic year for the sports production business. “The addition of having the Spidercam product on our stand has been a really good thing for us,” said Newton. “I think we’ve seen a wider variety of potential customer base come onto the stand here, thanks to the joint venture. “IBC is always well attended by our customers and by people who are looking to connect and talk about specific projects, so having a unique piece of equipment with a strong brand brings new customers to the stand,” he said. “In terms of our year it’s been exceptionally busy, particularly for our global flyaway business based out of the UK. We had four separate customers at the World Cup – from UK, Brazil, Argentina and Mexico. For the Mexican client we supplied a studio, and for the others it was a mixture of studio and IBC. Obviously each client has their own challenges — in the type of product they want to use and the way they want to deliver — but it’s always great to be involved in those events. “On top of that,” said Newton, “there was obviously the Asian Games where we provided eleven flyaways and eleven venues’ worth of facilities. In many ways it showed our strength as a group: there was provision of facilities from our UK, American, Australian and French offices – all contributing with their own flypacks, staff, crew. We’re really pleased with that on a Gravity Media Group level – that was a big thing for us,” he said. “It was also a challenge and a test of our systems over that busy period, where we were already delivering other big events for core contracts such as the ATP100 series for ATP Media and across the Canadian and Cincinnati events, and of course the US Open tennis which we do for ESPN. “Obviously a Grand Slam tennis event is astronomical in terms of size: we did the outer court coverage this year as well with the Fletcher Tr-ACE camera system which ESPN brought in and we supplied the Simply Live ViBox production replay element. And obviously the more traditional broadcast coverage that they do for the seven show courts, and the domestic service for ESPN as well, involving eight production control rooms. Once you’ve taken into account all the robotic cameras it’s something like 150 camera channels out there,” said Newton. “There are always challenges and logistics in moving tens of tons of equipment around the world,” continued Dowdall. “I think the Asian Games was 70 or 80 tons and the US Open was about 100 tons. We’ve come through to the other side, and hopefully delivered a successful service to our customer base. “We’ve recently invested in a small rental business in Germany,” he said, “originally branded Genesis and now branded Gearhouse Broadcast Germany. We’ve made a sizeable investment over the last six months there, with a dozen LDX-86Ns, a dozen or so box lenses, 20-odd barrel lenses, half a dozen EVS machines. We’ve tried the inventory quite rapidly. We’re very pleased with the direction that business is going in currently. “We also have a base in Paris, in Saint-Denis, with 20-odd people there,” said Dowdall. “That’s got a few more business streams than the German business. It was originally an RF business, known as Actus. They still do a lot of RF rental, and traditional broadcast box rental as well. It now has the same sort of stock as Germany, plus some flyaway systems as well. We’re building a pan-European Gearhouse rental business, with the ability to deliver and support that business,” said Dowdall. “We do have another brand in the UK, Hyperactive Broadcast,” added Newton, “which also does a bit of box rental but it’s core service has always been around nonlinear and workflow services, built around EVS and Avid. They do stock lenses and camera channels and EVS machines, but I would say the core of their business is nonlinear post – hence the cutting room facility we have in Soho branded Hyperactive,” said Newton. What are the key issues at this show, according to conversations you are having on the stand? “I think there are two things,” said Newton. “As a facilities provider we’re always looking for a point of difference in new technology. That’s why we go and do joint ventures with companies like Spidercam, giving us the ability to go and sell different production tools to our customers – but still very much technology focused,” he said. “And as a business, having started our journey from being a traditional SDI service provider over to IP, we’ve now invested in some Grass Valley (formerly SAM) technology which we will be deploying. We don’t see SDI dying, anywhere in the near future, but as a business we need to make sure we have the latest technology and the ability to deliver the latest technology to our customers. That’s what’s important to us as a service provider,” said Newton.